Mr. BALL - Did you ever leave the United States during the War? Mr. DOUGHERTY - Oh, yes. Mr. DOUGHERTY - Well, I was stationed, oh, for about a year up in Indiana up there---Seymour, Ind. Mr. BALL - Then where did you go from there in the service? Mr. DOUGHERTY - Well, I stayed there until I got discharged. Mr. BALL - And how long do you take for lunch? Mr. DOUGHERTY - Well, from 12 to 12:45. Mr. BALL - Forty-five minutes? Mr. BALL - Do you always take a full hour? Mr. DOUGHERTY - Yes; I usually do. Mr. BALL - Where did you eat your lunch? Mr. DOUGHERTY - In the domino room. Mr. BALL - Now, what time did you go back to work? Mr. DOUGHERTY - Oh, at 12:30. Mr. DOUGHERTY - Well, then, I went back to work. Mr. BALL - And where did you go to work? Mr. DOUGHERTY - Let me see---oh, up to the sixth floor. Mr. BALL - Did you go to the sixth floor? Mr. DOUGHERTY - Yes, sir. Mr. DOUGHERTY - At about 12:40---it was about 12:40. Mr. BALL - Had you heard any shots before that? Mr. DOUGHERTY - Yes---I heard one---it sounded like a backfire. Mr. BALL - Where were you when you heard that shot? Mr. DOUGHERTY - I was on the fifth floor. Mr. BALL - You were on the fifth floor? Mr. BALL - Now, When you left your lunch, did you go to the fifth floor or the sixth floor to go back to work? Mr. DOUGHERTY - I went on the fifth floor when I was getting ready to go down to eat lunch. Mr. BALL - Yes; and then what happened? Mr. BALL - Wait a minute---did you hear the shots before or after you had your lunch? Mr. DOUGHERTY - Before---before I ate my lunch. Mr. BALL - You heard shots before you ate your lunch? Mr. DOUGHERTY - Let's see---yes, I believe I did. So we can't be confident that Mr Dougherty brought down the west elevator just after the assassination? 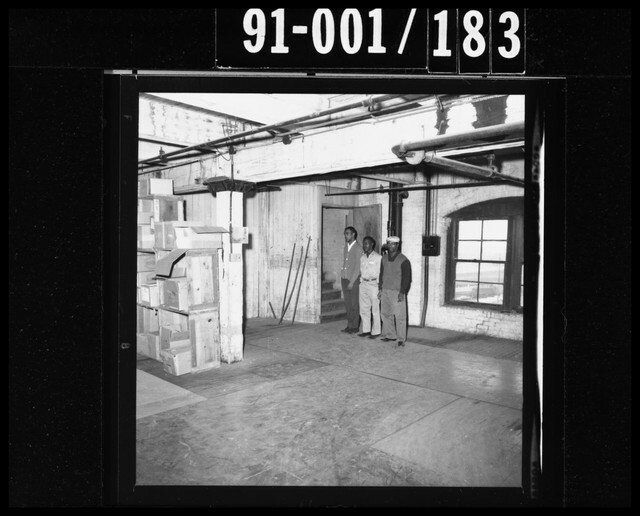 They were in the supply room on the southwest corner which had a cage north wall. They would have had a view of the staircase. Styles was adamant that they never left right away. No less than a minute she said. Any particular reason to prefer Styles over Adams? With the speedsters in their three inch heeled shoes clop clop clopping on the wooden stairs, Oswald was able to follow behind, with any noise that he may have been making being drowned out by that of the speedsters. Any good reason to think they “drowned out” anything, or is it just a convenient excuse? Tell us what you would do if you wanted to descend a staircase undetected and heard someone else's footsteps on said staircase. Did Dougherty have a hearing issue? Those that do can often mistaken for being confused or of low intelligence. If Dougherty misheard the question as.....Did you ever leave the State during the War? Are you questioning Ball's intelligence or Dougherty's, there are 60 minutes in a full hour? Dougherty was merely explaining what he usually did. He is relating when he went back to work that day. 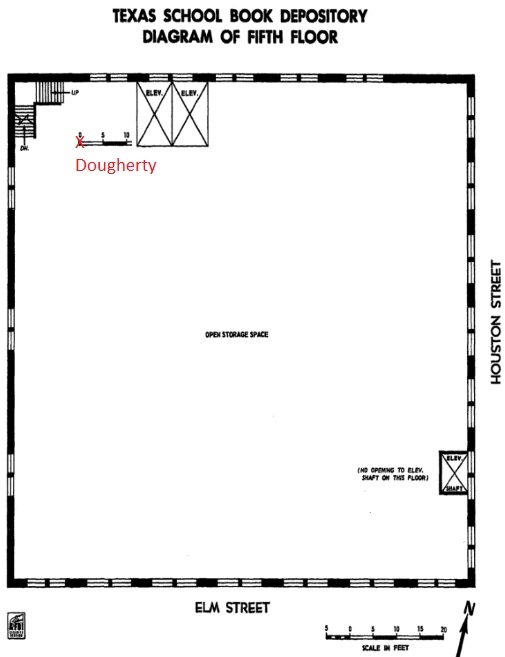 Dougherty had gone to the 6th floor just before 12.30 to continue work. He heard a shot and went down to the first floor. He then went back to work upstairs. He was spotted on the 5th floor by Truly who was coming down from the 7th floor with Baker. This would have been about 10 minutes after the shooting. Perhaps Dougherty is talking about the second occasion he visited the 6th floor. in any event it is only an approximation. I wonder if Dougherty heard this as "Now, When you left for lunch, did you go to the fifth floor or the sixth floor to go back to work? He merely informs that when he went down to lunch he left from the 5th floor. Now he gets back to the original theme......his position at the time of the noise he heard. Mr. DOUGHERTY - Before---before I ate my lunch? Mr. BALL - You heard shots before you ate your lunch. Who knows, maybe he thought it was an instruction. 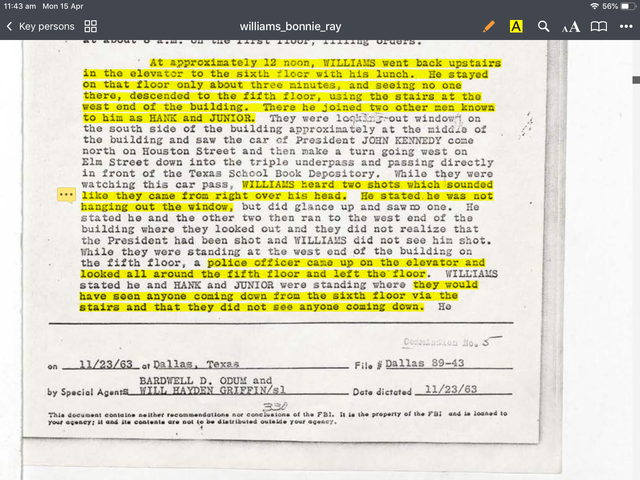 Do you doubt Dougherty was close to the 5th floor west elevator at the time of the shots? Do you believe it was he who moved the elevator from the 5th floor some time after Truly called for it and the time he arrived on the 5th floor? This would have been between 1 and about 4 minutes after the shots. Styles was not adamant, she was most varied of the three woman we have record. Adams maintains an almost instant departure and is consistent and adamant. Garner says they left before she noticed and she immediately followed them heard them descending on the stairs and then sees T&B coming up. Inferring a very early leaving by A&S unless you want a much latter ascent by T&B and Reid. Even Dorman gives an sense o urgency to her departure and as I said describe her following Garner with the word "run". Styles gives varied vague estimates, almost wanting to agree with whatever anyone suggest to her. According to the account given by Sean Murphy, Styles thought that they had left quite a bit later than Adams' recalled. Styles went on to give up on some of that time but then finished with "no less than a minute". Adams seems to have been a bit unstable. Her signed and notated deposition speaks for itself though. The encounter with Lovelady and Shelley rules out an early descent. Do you mean as a comment in addressing my original post? If so you didn't. If it was a comment relating to the original investigation, they didn't. We are left with the situation that either Dougherty moved the elevator or an unknown did, someone who was not an employee or an accused assassin.